Fig. 828 Check Valves, also referred to as Extraction Check Valves, prevent backflow in steam and water lines to protect valuable equipment from damage. Used in extraction lines from steam turbines to feedwater heaters, heating systems or process equipment, these extraction check valves are engineered for exceptional reliability. Where reverse flow is desired, the valves can be configured to remain open until closed by a cylinder actuator on signal. Fig. 828 Check Valves are available in a variety of configurations to suit application requirements. In addition, they can be manufactured with soft packing, hardened leak-off bushings, and various materials for critical applications. Fig. 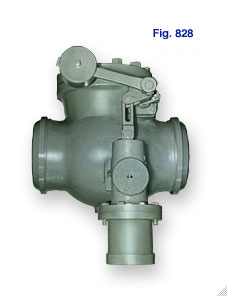 828 Check Valves are in use at industrial power plants at boiler feed pumps, compressors, and in process lines. Extraction Check Valves are also used at chemical and petrochemical plants in reactor emergency shut off, compressor kick-back, and suction check. Designed for minimum pressure drop and easy maintenance. Fig. 828 Check Valves are designed to permit full access to internal components without removal from the pipeline. This can reduce maintenance and inspection costs considerably. Rockshafts are made of stainless steel with bushings of Monel. Freezing or binding is far less likely to occur than in valves using less corrosion-resistant materials. When intended for service in vacuum lines, rockshafts are provided with water seal lanterns. Reverse flow prevention in process line. Turbine protection as bleeder non-return valves for electric utilities. For more detailed information about Check Valves, Bulletin 8K Literature. To submit a Request for Quote (RFQ) for Check Valves submit an online interactive General RFQ Form.